I developed a sweet tooth this year. Wait. Let me elaborate. I’ve always had a sweet tooth (let’s be real), but I’ve recently discovered that I can also appreciate the “stickier” sweets—like cinnamon buns and sugary Danishes—but especially when it includes some form of toasted pecans. I can’t seem to get enough of this crunchy, nutty goodness! 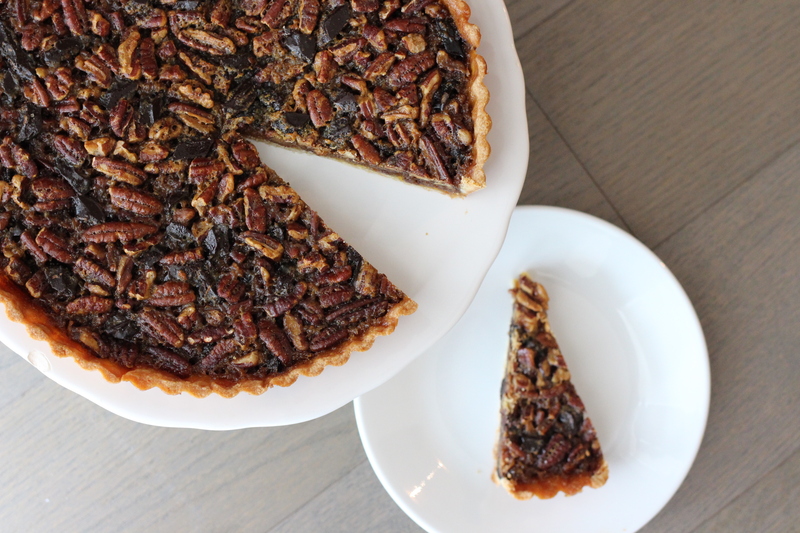 So naturally, it seemed like a good time to explore my fall pecan dessert options and of course you can’t escape the traditional pecan pie! I wanted to give this traditional sweet treat a little twist, adding a darker-softer note with chunks of dark chocolate and by employing rice syrup as opposed to the usual corn syrup base. What transpired was nothing short of delicious! 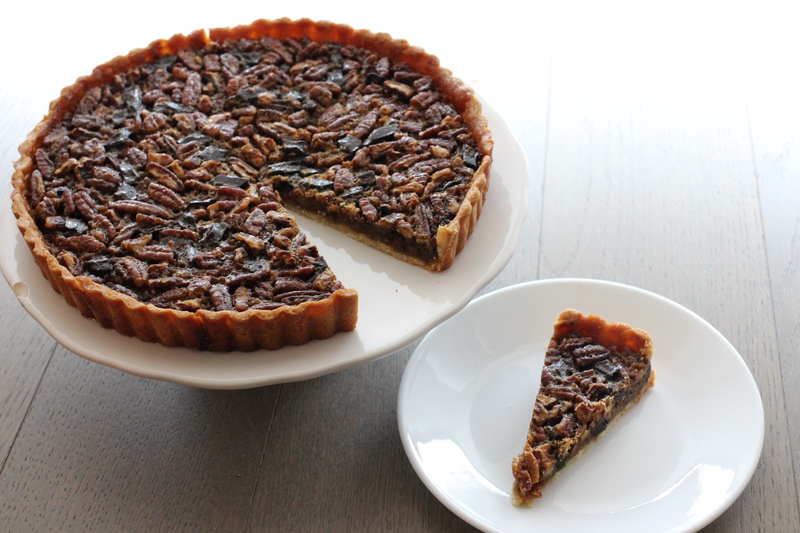 This chocolate bourbon (because everything is better with bourbon) pecan tart was just the right amount of sticky without the ooey gooey mess of other similar desserts. The shallower almond tart shell makes for slices that don’t have as much of the custardy filler as the usual pie, but is more nut- and chocolate-dense, which is exactly my preference! This tart can be easily made ahead of time and freezes well, too! But it can also be made in a pinch and quickly cooled in the fridge to set. I’ll be bringing this with me to this year’s Friendsgiving and I would highly recommend for any Thanksgiving festivities of your own! 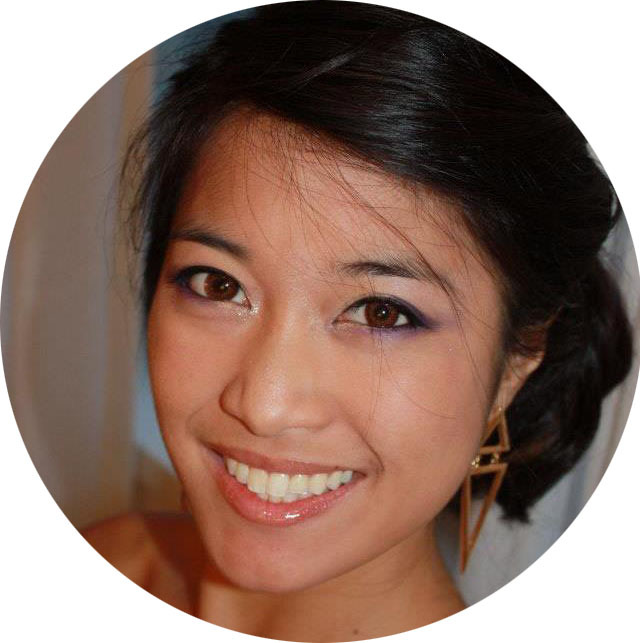 Thank you so much for dropping by—best wishes for a wonderful Thanksgiving holiday for all who celebrate, and “may luck be ever in your favor” for those looking out for good deals on Black Friday :) I’d love to hear from you, your thoughts, and what you’re most looking forward to this holiday season so leave a line in the comments below! 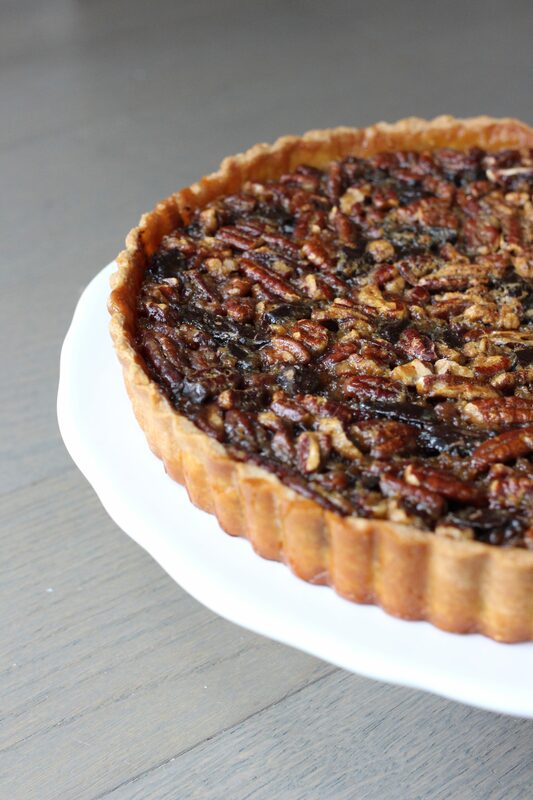 This dark chocolate bourbon pecan tart is a deliciously decadent fall seasonal dessert. 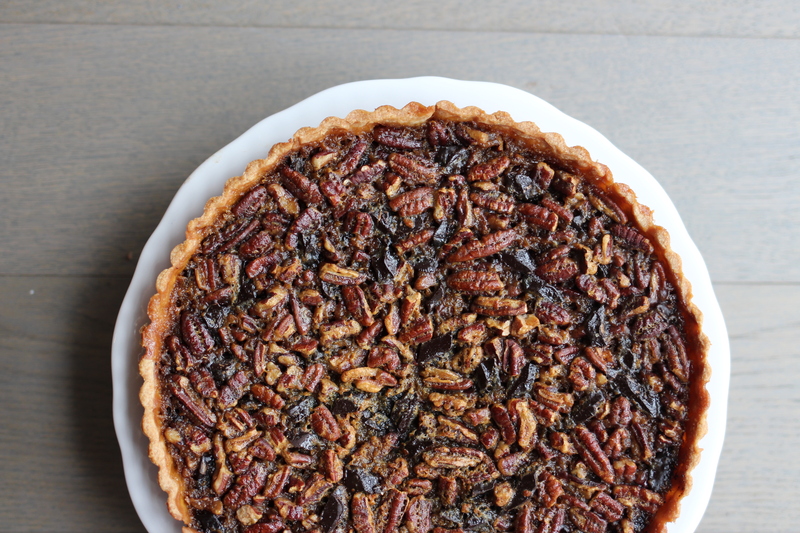 Complimentary notes of sweetness and bitter dark chocolate work to enhance the flavor of the toasted pecan and almond sucree crust. A definite crowd pleaser! On a floured surface, use a rolling pin to roll out dough to about ⅛-inch thickness and roughly 12-inches in diameter. Trim excess dough from tart ring and dock* dough. Blind bake crust for 8-10 minutes with pie weights. Remove from oven, remove pie weights, and let cool slightly. Meanwhile, toast roughly chopped pecans (about 8-10 mins at 350F). Mix together eggs, syrup, molasses, sugar, butter, vanilla, and bourbon until well incorporated. 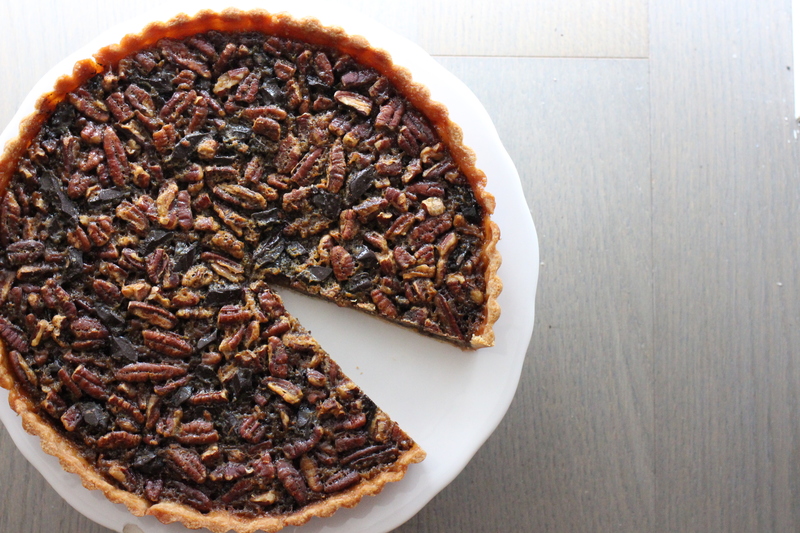 Arrange pecans and chopped chocolate in tart crust as desired. Pour egg mixture over pecans and chocolate, taking care not to flood the crust. Bake 30 mins until center looks set and does not jiggle when moved. Cool to room temperature prior to serving. This can be expedited in the refrigerator. Enjoy! This tart can be made ahead of time and frozen up to 2 months. Thaw in the refrigerator, and bring to room temperature prior to serving.